Own this peaceful and open home with tasteful upgrades in all the right places. Take advantage of the hard work and vision of owners who put their hearts into making this home something truly special. Removing a large barrier in the main living area created an open and bright great room. All carpet replaced with wood-like tile with gorgeous tones. An inviting built-in corner bench was added in the breakfast nook, waiting for your table. In the already open kitchen, stainless steel appliances were added. The entire interior of the home was freshly repainted with a modern palette. Three large windows frame a lush backyard scene, always inviting you out. In the backyard, a built-in barbecue and custom bench were constructed. Directions: N. on North Valley Pkwy. E. on N. 33rd Lane. Take 5th left (also 33rd Lane) to end. Right to home on right. Partial floor update in 2017. Approximate size: 6783.00 sq. ft. 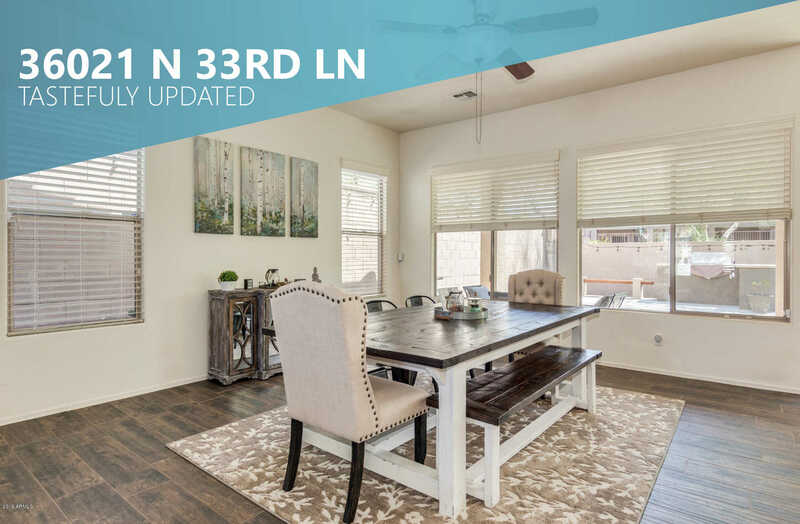 Please, send me more information on this property: MLS# 5906745 – $359,950 – 36021 N 33rd Lane, Phoenix, AZ 85086. I would like to schedule a showing appointment for this property: MLS# 5906745 – $359,950 – 36021 N 33rd Lane, Phoenix, AZ 85086. This content last updated on April 18, 2019 14:52. Some properties which appear for sale on this web site may subsequently have sold or may no longer be available. © 2019 North Scottsdale. All Rights Reserved. Real Estate Website Design powered by Home Junction.